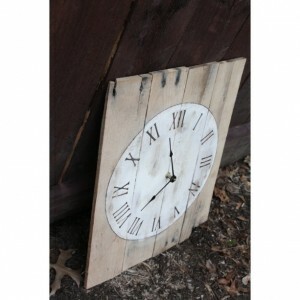 We've reclaimed pallet wood and put to good use in this rectangular, rustic, natural, hip pallet wood clock. 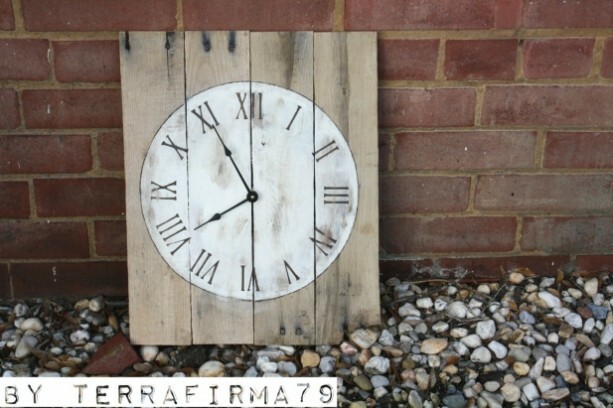 Above, a round clock face (approximately 12 inches in diameter) was painted onto a rectangular shaped group of 4 vertical facing pallet wood boards. 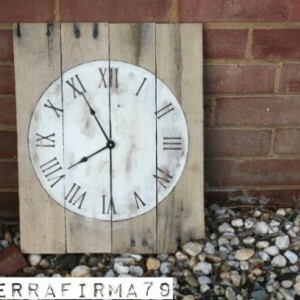 It was tastefully distressed and aged with sanding and brown-tinted finishing wax. 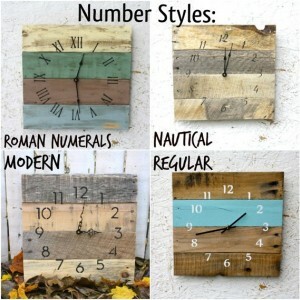 The exact clock in this listing has been sold already, but I can redesign a very similar clock. It will measure approximately 17.5 inches tall by 14 inches wide and will be painted to replicate what is shown above. The distressed dark brown Roman numerals and faint, non-perfect black edge to the clock face circle add to the charm of the original piece. (We have regular and italicized numbers available too--just ask). 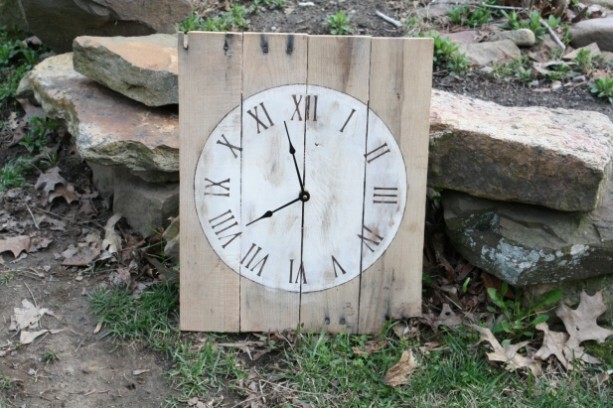 We use small pieces pieces of square pallet wood to add stability for hanging your clock. To each little block, we screw in "screw eyes" with picture-hanging wire for easy hanging on your wall. *Please convo me if you are interested in another color scheme or motif. 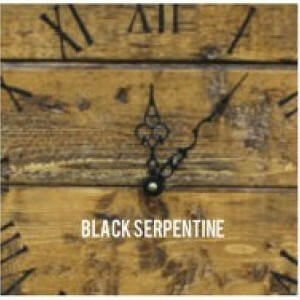 I'd be happy to custom design your clock. Please allow 2-3weeks for orders to be completed. 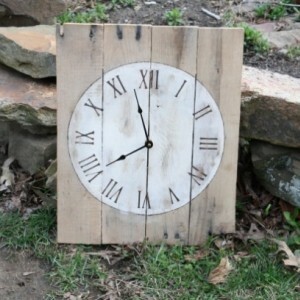 Because I reclaim the wood I use for my designs, you can expect that each clock will be a unique work of art. The imperfections you may see will surely add to the authenticity of the art. The clock hardware set I use is made by QUARTZ and makes no noticeable ticking noises. You'll be able to rest in peace. *Battery not included. 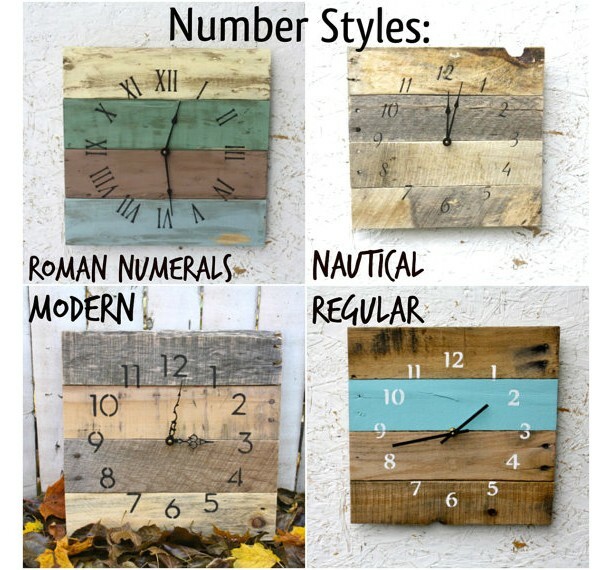 I can paint the clock hands any color you want. Be sure to include your color preference in the CONVO or in a message before you order. If you do not specify a color, they will be the color shown in the pictures. ~ ~ Please allow approximately 2-3 weeks for your clock to be cut, constructed, designed, painted, stained, tested and packed and shiped. (Thanks for your patience and understanding). Please ask any and all questions you may have. INTERNATIONAL BUYERS; I would love to ship to you, but please message me for a shipping quote as the destinations vary too much to safely say.